Life Doesn’t Imitate Art, Life IS Art! Ideation – execution. Paper – practice. Knowledge – results. Good – great. The transition from the left to the right of that little hyphen is what is crucial. This transition is usually challenged by what is called the ‘innovation gap’ – the vision-action shortfall. Innovation gaps are dangerous; they stagnate the minds of the workforce and endanger the organisation’s competitive edge and hence its future. The best way to bridge this gap is to foster creativity. The spark that enables smooth transition from vision to action is at the core of any organisation’s growth, and subsequently its survival. Traditional training methods such as endless PowerPoint presentations and online certifications rarely get the creative juices flowing. As our understanding of leadership and managerial responsibility has evolved, business leaders are slowly understanding the need to go beyond conventional pedagogy and training methodologies. And what better way to go beyond and drive innovation creatively than art, the very nature of which is creative? 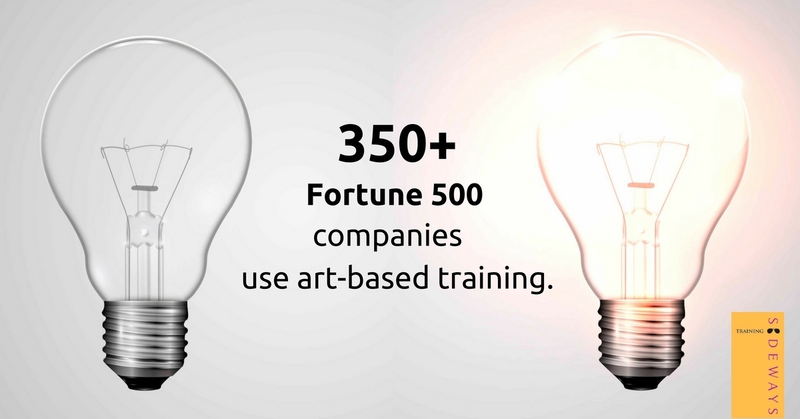 Art-based methodologies have found a strong foothold in many forms of education and training, most effectively in the areas of business and leadership. While thinking is constrained in conventional methods, art-based training adapts real life situations and forces thinking out of the box. It provides fresh perspectives and a better visualisation of problems and possible solutions. At Sideways, coming from a rich background in theatre and performing arts, we strive to translate our knowledge of art to practical training approaches – a result of art in our own training! Theatre, music, dance, games, role-play and simulations all come together, customised for each organisation according to the nature of their workforce, and tailor-made to address their specific organisational and workforce needs. Inculcating useful artistic skills to be applied in organisational settings. The example they give is medical residents being taught theatre skills to increase their clinical empathy. Our SuperSalesman 2.0 workshop uses a lot of storytelling skills which can be used for pitching and closing a sale, recently used in a workshop for Mead Johnson. Where conventional training fails, arts-based training helps get in touch with inner thoughts and feelings. It enables one to project ideas and thoughts through art, and reflect on it. Example – managers/leaders engaging in building three-dimensional representations of their organizational strategy using LEGO bricks. We used this technique recently in a vision-setting workshop for a project team at HUL. Also, this technique is used in self-introspection exercises as part of our Executive Presence workshop and the Celebrate Yourself workshop for women. Art can be used to effectively illustrate the essence of a concept. Example – films with strong leadership in characters such as Lion King, Invictus, Coach Carter, Any Given Sunday etc. being used to illustrate key ideas about leadership. We have illustrated a lot of concepts like time management through play simulation, 6 thinking hats and building trust through theatre, negotiation skills through 12 Angry Men. These have been brought alive with clients like Viacom 18, Accenture and Vodafone. Art as a way of expressing oneself, to understand one’s creativity and thinking prowess better. Example – MBA students taking art classes to enhance their creativity. Our corporate storytelling workshops done for clients like Vodafone, Viacom18, Accenture and UTV Disney are a case in point! Arts-based training goes beyond imparting skills. It shapes perspective, makes learning fun and most importantly, has a lasting impact. It is the difference between reading a recipe and actually cooking it – you know which way tastes better!